How to Work the Film & TV Markets takes independent filmmakers, television and digital content creators on a virtual tour of the entertainment industry’s trade shows — the circulatory system of the entire global media landscape. This book highlights the most significant annual events around the world, details a dossier of all the players that frequent them and examines all the elements that drive the market value and profitability of entertainment properties. In-the-trenches insights from our modern, real-world marketplace are contextualized into immediately implementable practical advice. Make the most of your finite investments of funds, time and creative energy to optimize your odds for success within the mainstream, business-to-business circuit but learn how to select, apply and scale prudent, proven principles to drive your own Do-It-Yourself/Direct-to-the-Consuming-Crowd fundraising, distribution and promotional success. Heather Hale demystifies these markets, making them less intimidating, less confusing and less overwhelming. She shows you how to navigate these events, making them far more accessible, productive — and fun! A social media speed tour with a wealth of audience engagement ideas. Visit the book’s space on www.HeatherHale.com for additional resources and up-to-date information on all these events. Chapter 1 What Is a Market? What’s the Difference Between a Market and a Festival? Should You Go to Either? Both? Why? Aren’t Film and Television Totally Different Industries? You Might Be an Independent If . . .
Chapter 2 To Hollywood, Bollywood, Nollywood — and Beyond! Speed Pitching: Now You’re Talking — FAST! 30 Minutes With . . .
What Can You Realistically Accomplish at This Market? But What If I’m Not Really Ready Yet? But my film/TV show is for everyone . . .
Should I Bring Scripts to the Market? Chapter 23 What Goes Into a Pitch Package? Don’t Ignore Your Own Badge . . .
A Word of Caution: Check Those Definitions! Always Have an Answer For: "What Else Have You Got?" Heather Hale is a film and TV director, producer and screenwriter of original programming, including the indie comedy Rolling Romance (2018), the thriller Absolute Killers (2011), the Lifetime Original Movie The Courage to Love (2000), as well as several award-winning syndicated series and two Emmy-winning PBS series. She was the Independent Film and Television Alliance’s Industry Liaison for the 2013 American Film Market as well as the Vice President of Event Programming for the National Association of Television Program Executives, where she helped design and launch the TV Producers' Boot Camp. She often serves as NATPE’s official pitch prep consultant, preparing producers to pitch to financiers and distribution executives. Heather speaks and consults around the world, customizing retreats and workshops and is always writing, producing, directing and raising funds for film and television projects. "For years, I've watched producers and other film creatives spend countless dollars to attend markets such as AFM, Cannes and MIPCOM only to leave discouraged. Simply put, they didn't plan ahead and understand how to work the markets. No one knows this area better than Heather Hale. 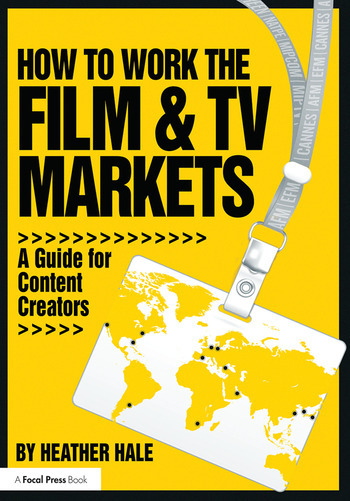 With How to Work the Film & TV Markets, Heather not only provides content creators a wealth of information designed to help remove the intimidation factor and anxiety inherent in attending a market, but also provides a clear path toward maximizing your precious time and, by virtue, increasing your odds of success. This is essential reading for anyone looking to drum up interest in their projects. Not to be missed." "Years of visiting the film and TV markets provide a certain level of knowledge of this complex, global dance of finance, development, networking, co-productions, and the like. With Heather Hales’ go-to guide in hand, the complexity of the annual cycle of these crucial markets is remarkably clear and easy. Hales’ extensive knowledge and insider tips will guide you to a whole new experience of attending such markets, saving time, money and embarrassment. It’s simply superb with constantly-updated key info and tips – worth every penny, and my planned gift to industry friends." "Heather Hale has a keen prospective on the workings on in the film and television marketplace. A must-read for anyone that has a project and needs to know how to maneuver through the challenging aspects of sales and distribution."